While there are many very good Docker tutorials currently available, I found that many are either too simplistic in the scenarios offered, or in some cases, too complex for my liking. Thus, I decided to write my own tutorial that describes a multi-tier architecture configured using Docker. 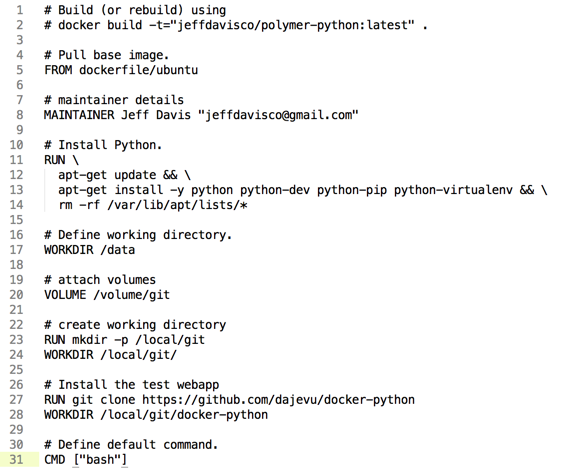 This tutorial assumes that you have successfully installed Git and Docker. I’m running Boot2Docker on a Mac, which enables Docker to be run nearly as though it were installed natively on the Mac (on the PC, Boot2Docker isn’t quite as straightforward). I assume some basic level of familiarity with Docker (a good source of information is https://docs.docker.com/articles/basics/). 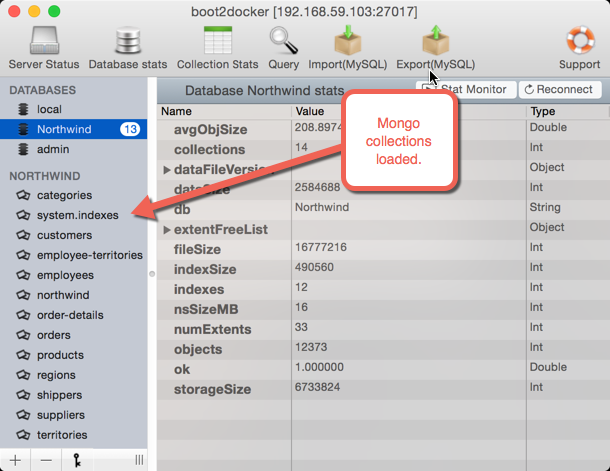 MongoDB: This is our persistence layer that will be populated with some demo data representing customers. API Server: This tier represents Restful API services. 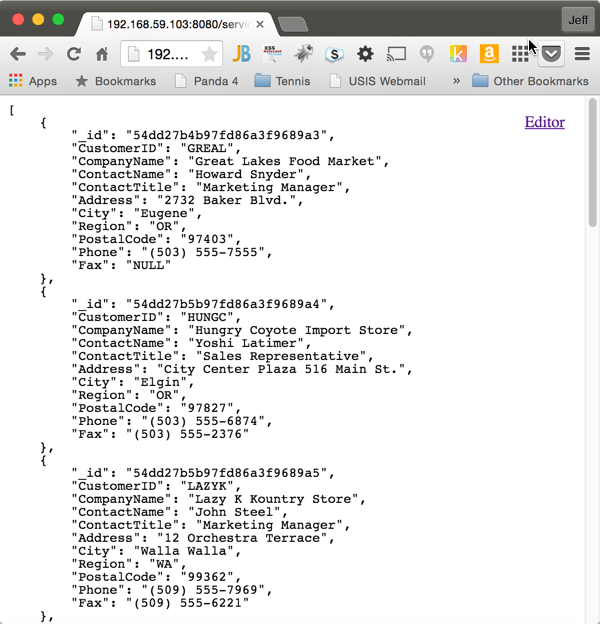 It exposes the mongo data packaged as JSON (for purposes of this tutorial, it really doesn’t use any business logic as would normally be present). This tier is developed in Java using Spring Web Services and Spring Data. I’m not going to spend much time on the implementation of each tier, as it’s not really relevant for purposes of this Docker tutorial. I’ll touch on some of the code logic briefly just to set the context. Let’s begin by looking at how the persistence layer was configured. Note: The project code for this tier is located at: https://github.com/dajevu/docker-mongo. Line 5 identifies the base image used for the mongo installation – this being the official dockerfile/ubuntu image. Since no version was specified, we’re grabbing the latest. Note: Comments in Dockerfiles start with #. 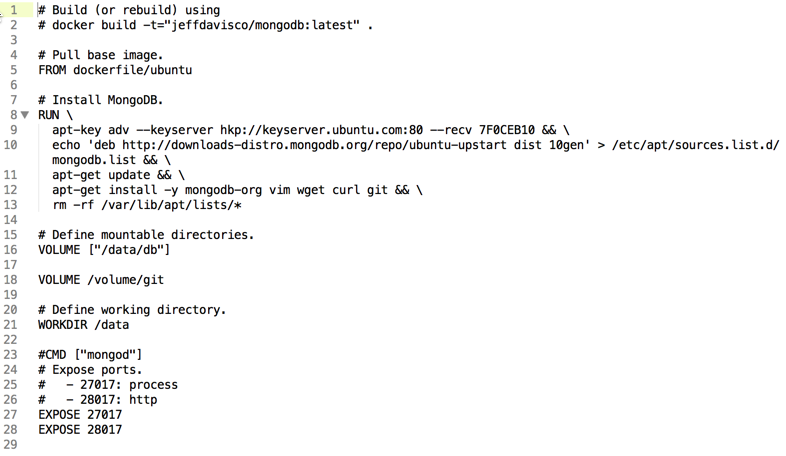 Line 8 begins the installation of the mongo database, along with some additional tools such s curl, git etc. Ubuntu’s apt-get is Ubuntu’s standard package management tool. Lines 16 and 18 setup some mount points for where the mongo database files will reside (along with a git mount point in case we need it later). On line 21, we set the working directory to be that data mount point location (from line 16). And lastly, we identify some ports that will need to be exposed by Mongo (lines 27 & 28). If you don’t see any results from docker ps, that means that the container started but then exited immediately. Try issuing the command docker ps -a- this will identify the container Id of the failed service and you can then use docker logs to identify what went wrong. You will need to remove that container prior to launching a new one using docker rm. This script simply runs through each .csv file present in the directory, and use the mongoimport utility to load up the collection. However, there is one little wrinkle. Since mongoimport is connecting to a remote mongo database, the IP address of the remote host is required, and this remote host is the mongo container that was just launched. How did I determine which IP address to use? If you are using Boot2Docker, you can simply run boot2docker ip – this will provide you the IP address of the Docker host you are using. If you are running directly within a host running Docker, you could connect via localhost as your IP address (since that port was exposed to the Docker host when we launched the container). Fortunately, we don’t have to go through such hurdles on the remaining containers. The API service is a very simple Restful-based web service that simply exposes some of the mongo data in a JSON-format (granted, you can access mongo directly through it’s restful API, but in most real-world scenarios, you’d never expose that publicly). 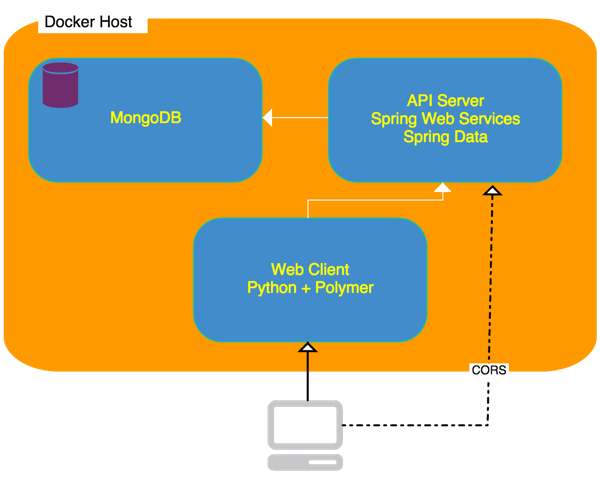 The web application, written in Java Spring, uses the Spring Data library to access the remote mongo database. 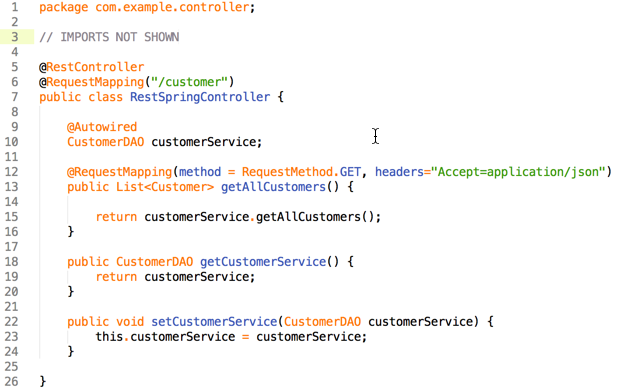 Using the Spring annotations for Spring web services, we annotate this controller in line 5 so that Spring can expose the subsequent services using the base URL /customer. Then, we define one method that is used to expose all of the customer data from the Mongo collection. The CustomerDAO class contains the logic for interfacing with Mongo. As you can see, in line 2 we’re identifying the base image for the API services as Java 7 image. 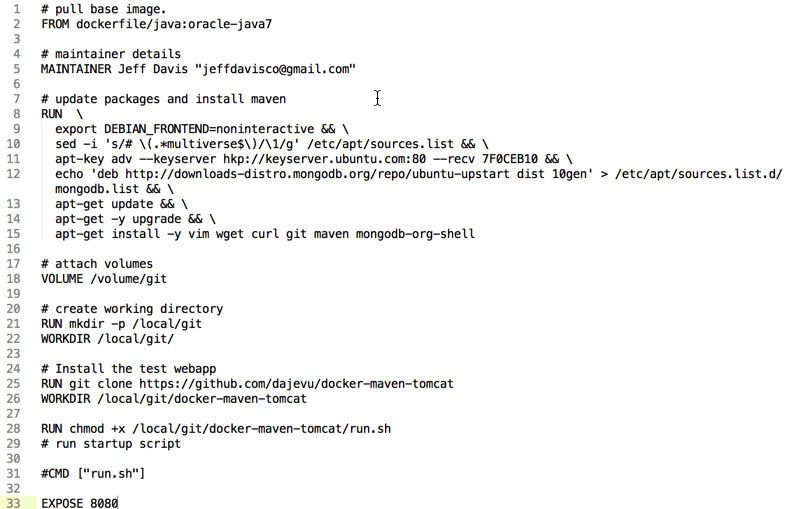 Similar to the mongo Dockerfile, the next thing we do in lines 8-15 is install the various required dependencies such as such git, maven and the mongo client. As you can see, it’s pretty minimal. We first echo the environment variables from this container so that, for troubleshooting purposes, can see them when checking the docker logs. 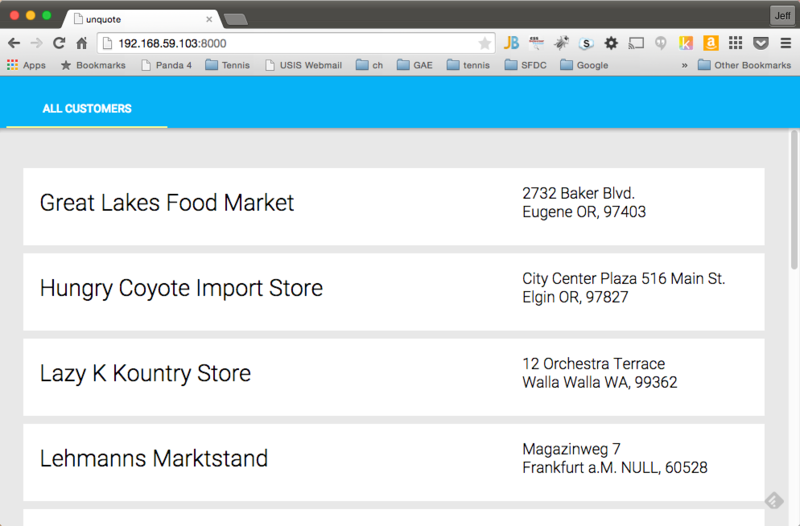 Then, we simply launch the web application using mvn jetty:run. Since the application’s source code was already downloaded via git clone, maven will automatically compile the webapp and then launch the jetty web server. The environment variables starting with MONGODB represent those created through the link. How did it know to prefix was MONGODB? That’s simply because, when we launched the mongo container, we specified the optional —name parameter that provided a name alias for that container. Now, how is that incorporated into the API service? When we define the Spring Data properties for accessing mongo, we specify that an environment variable is used to identify the host. This is done in the spring-data.xml file (located under src/main/resources in the project code). Now, let’s look at the last of the containers, the one used for exposing the data via a web page. This Dockerfile is quite similar to the others we’ve been using. Like the mongo container, this one is based on the official ubuntu image. We then specify in lines 11-14 that Python and related libraries are loaded. In line 23-24, we prepare a directory for the git source code. We follow that up by then fetching the code using git clone in line 27, and then set our working directory to that location (line 28). (the CMD command in line 31 is actually ignored because we specify in the launch script which command to run (i.e., it overrides what is in the Dockerfile). A couple of things to note in the above. Notice how I’m passing the IP address of my Boot2Docker instance using the environment flag -e VMHOST=192.168.59.103. Similar to what we needed to do when configuring the API service tier, you will have to modify this for your environment (if using Boot2Docker, run boot2docker ip to find the IP address of your docker host, or if running natively on Linux, you can use localhost). Notice the other thing we are doing is exposing port 8000, which is where our Python web server will be running under. Lastly, we are instructing the docker container to run the run.sh shell script. We’ll look at this next. You’ve now completed the tutorial! You have a docker container running mongo; another running an API service; and the last running simple web service. I hope you’ve enjoyed this tutorial, and I hope to have a follow-up to it shortly describing how these the contains can be more easily managed using fig (learn more at: http://www.fig.sh/). Reference: Multi-Tier Architecture Tutorial using Docker from our JCG partner Jeff Davis at the Jeff’s SOA Ruminations blog.